As we drove down the mountain, the fog disappeared. But we still never saw the sun all day. 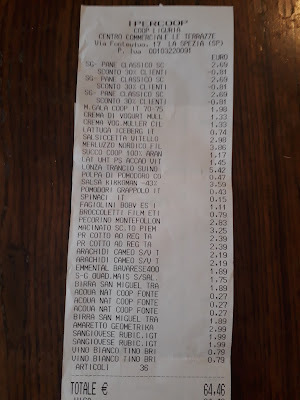 It was a 45 minute drive from the time we left Zignago and arrived on the outskirts of La Spezia at a big shopping mall that has a big Ipercoop grocery store. The mall was so busy that we had a hard time finding parking! After driving around the parking garage a couple of times, I finally spotted what looked like an overflow area and we got parked up there. The Ipercoop store had a huge gluten free section. And, they had the gluten free bread that we like on sale at €1.88 ($2.76 CAD, $2.10 USD) per loaf. Grabbed three of them! And, a couple of 500 ml cartons of Mueller yogurt. They put so many cherries in their cherry yogurt! €1.33 ($1.95 CAD, $1.45 USD) each. For most fruit and vegetables, they have self serve scales that print out your price sticker in that section of the store. You have to remember to do this prior to going to the cash! And you have to watch yourself with some of the fruit and vegetable prices. Some items are priced "each" and some are "per kg". We are used to buying a head of iceberg lettuce "each", so when Ruth saw the price at €1.99, she thought that was each! But then we had to weigh it and get the printed out price sticker and it came to €0.74. Much better! We bought a small pork roast, and some sausages, and ground beef. A couple of bags of peanuts for snacks, and some sandwich meat and two different types of cheese. And we stocked up on some booze. Like in any civilized country, alcohol is sold in the grocery store, just like it should be. It's a little more expensive here in Italy compared to Spain, but still reasonable, especially if you look for deals. The only thing I'm not happy with is the Italian beers. Of course Italy isn't known as a beer producing country, and I haven't found one yet that I like. So I've resorted to buying imported Spanish beer that's available here. I buy them in big one liter glass bottles, so that makes the price per glass a little more reasonable. And we've learned that most white wines are perfectly drinkable in the one liter cardboard containers. Not so much on the red wines though. We spend a little more money on the reds, but we've found some that we like that were on sale for €1.99 ($2.90 CAD, $2.20 USD) for a 1.5 liter bottle. Not bad. And check out the price for a knockoff bottle of Amaretto...€2.99 ($4.40 CAD, $3.30 USD)!! It always takes us so long to do grocery shopping in a different country. Checking ingredient labels is more time consuming, and looking at the different types of products. But, we enjoy it...it's all part of the world of travel! We got our goods loaded into the car, and set off to the waterfront just to check the place out. But there is some kind of festival going on in La Spezia this weekend, and it was a zoo! Couldn't have found a parking spot if we had tried. In fact, we realized afterwards that a lot of people were parking at the big shopping mall and taking the bus into the center of the city. So we just headed back into the hills and up to Zignago. So, sorry...no other photos for you today! We'll try and make it up to you over the next few days....lots more scenery to enjoy, and the weather is clearing up! Coleman oversize camping chairs. These are great chairs...check out the price! Checking out the local grocery store is part of exploring new areas and can be very informative as well as interacting with the local people. Yep, it sure is and we love it, unless of course we are in a rush then it can be a little frustrating because it takes us so long to get what we need. We have heavy wet fog right here in Houston this morning. Fog can be nice at times but not if you have to drive in it! One of our favourite things is grocery shopping in another country. So glad you enjoy it too! It is always a very interesting time. The food here in Europe is so much better in general than back home, it is so much more pure! Yep, would have been fine. The high temperature yesterday was only 12C (54F) and there was no sun. Do the big grocery stores provide you with bags to carry your groceries when you do a large shop? When we were last in Germany and Austria, smaller mom and pop grocery stores did not and we forgot about that. Thank goodness my husband and son were with me, and we stuffed our purchases in our coat pockets and my shoulder bag, anywhere we could find an empty space. They do if you want to purchase them, otherwise you need to bring your own. It was the same in Spain and Portugal and I think that we needed them in Romania, Moldova and Transnistria as well. Even most of the grocery stores in Canada now, you need your own bags or you have to buy some. It is very rare we forget to have some with us! "Like in any civilized country, alcohol is sold in the grocery store, just like it should be." I love living in a civilized country. Viva Mexico! Yep, you are very lucky! Ontario, Canada is just now starting to sell some wine in the grocery store but it isn't cheap! Not sure about beer. I spend a long time in grocery stores in California where I live, just looking and comparing, checking out the new stuff ... and it does take forever! Unless I just need one thing (haha) and then I can be speedy gonzales. I never minded grocery shopping unless I felt like the prices were really unfairly high, and -- on occasion -- you gotta bite that bullet and buy, but that's usually Out and About somewhere. I'm like you guys, tho ... I love a bargain! We tend to spend a lot of time reading labels as well because unfortunately there is way to much crap put in foods these days and we want to buy food with the least amount of it in it. Europe seems to be a bit better about that with their foods but we still have to look and that takes even more time because we have to translate as well. It should be REALLY interesting when we get to Morocco!